Rally for Bradley Manning this weekend at Quantico and around the world! Join Courage to Resist and friends to rally in support of accused WikiLeaks whistle-blower Bradley Manning this Sunday, March 20 near the Marine Corps brig at Quantico, VA, where Bradley is being held in pre-trial confinement. Meet at 2pm, Rt.1 and Anderson Rd., Triangle VA (map). Reserve your bus seat from Washington DC (only $10 round trip). Events in over 20 cities (and counting) around the world to protest the inhumane conditions Bradley has been kept in for nearly 300 days. Free Bradley Manning now! Bradley facing death with new charge of "aiding the enemy"
Supporters will gather for a 2pm rally at the town of Triangle (intersection of Anderson Road and Route 1/Jefferson Davis Hwy), then march to the gates of Quantico. Bradley has been held at the Quantico brig in solitary-like conditions for eight months without any meaningful exercise. We stand for truth, government transparency, and an end to our occupation wars… we stand with Bradley! Event endorsed by the Bradley Manning Support Network, Veterans for Peace, Courage to Resist, CodePink, and many other groups. We will meet at 2pm immediately adjacent to Rt. 1 and Anderson Road. Parking can be found at the Marines Corps Museum. They have HUGE parking lot, there. About 1/4 mile walk. There might also be some parking behind church adjacent to Inn Rd and Rt. 1, behind the rally location. Reserve your seat (only $10 round trip) on our chartered bus from Washington DC at couragetoresist.org/bus. Buses will leave from in front of Union Station, Washington DC, at 12:30pm. 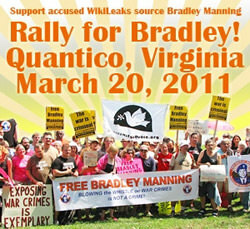 On March 19-20, 2011, thousands will take to the streets to protest the U.S. government’s treatment of accused WikiLeaks whistleblower Army PFC Bradley Manning. Bradley has been held in isolation for nearly 300 days. Last week, US State Dept. spokesperson P.J. Crowley, declaimed Bradley's treatment by the Army as “ridiculous and counterproductive and stupid.” He has since resigned.